Whenever you extract a cork from an old bottle, there’s always the danger of the cork breaking or falling into the wine. Serious sommeliers and collectors have various tricks for preventing this from happening, and one of the best is to twist in a traditional corkscrew to keep the cork in one piece, and then use a two pronged Ah-So cork puller to get the whole thing out. The Durand, designed by Atlanta collector Mark Taylor, delivers both pieces in one package so that they fit together properly and securely. That, combined with the decent heft of the device, makes it feel stable. Testing proved that it works. The only tricks are rocking the blades of the Ah So as you inset them, and getting that first twist started. 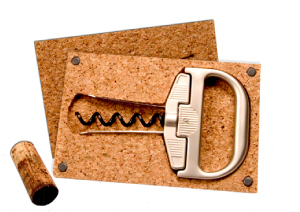 But with The Durand, at least you can be sure the cork won’t disintegrate and crumble into your bottle. The Durand worked like a charm with one or two particularly saturated and tired looking corks being extracted without difficulty.